The highly energetic atmosphere in Sedona is known for uplifting, expanding, and transforming those who are open to experiencing it. Many individuals tend to experience a shift after spending just a short amount of time in Sedona. Some attribute this uplifting transformation to Sedona's awe-inspiring natural surroundings; others say it is the strong presence of mystic and new age metaphysical wisdom; while some believe it the existence of many energetic vortex spots throughout Sedona's landscape… It translates differently for each and every one of us, but one thing is for sure- something magical is happening in Sedona. 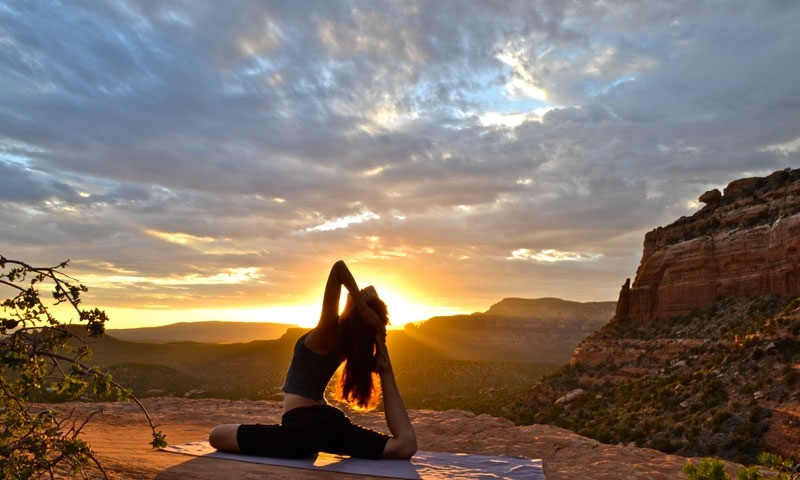 Yoga is just one of the many ways to fully experience and get in touch with the magic of Sedona. While yoga has many physical benefits, such as strengthening and detoxifying the body, it ultimately serves as a tool to still the body and mind for mediation, expand consciousness, and connect us to a higher source, whatever that source may be for you. As you explore Sedona, you will begin to notice that the landscape seems as if it was made for yoga and mediation. Large slick sandstone flats make for the perfect space to come onto the mat while towering red rock perches provide us with the most breathtaking meditations seats. Perhaps you are completely new to yoga or would just like an experienced yogi who knows the area to show you some of the best spots to go. Opt to take a guided yoga hike or perhaps an extended spiritual retreat with one of Sedona's knowledgeable guides. A highly recommended Bikram yoga studio in West Sedona, offering a variety of teachers and styles. An hour and a half of hot yoga followed by a sunset hike will be sure to lift your body mind and soul. Enjoy the inner and outer journey! Namaste.